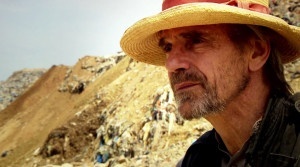 On a beach beside the ancient Lebanese city of Sidon, actor Jeremy Irons stands beside a towering mountain of waste – the result of 30 years of consumption by just one small city in the world. As the day’s new consignments are tipped on top, debris tumbles off the side and into the blue of the Mediterranean. It’s a sight Irons is to see repeated around the world, as he travels to some of our most beautiful destinations to discover the extent and effects of our global waste problem.